Woodrose is a romantic room on the third floor of The Library building. It has a dramatic bathtub built into the dormer window with views over the harbour. There is a separate shower. Windows are all insulated and this is considered a quiet room.Entry is from the verandah ( this is a rear access verandah overlooking the property behind us and is communal with Milkberry room ). The Landing guest rooms are housed in 4 buildings; The main building above the bar and restaurant, The Captain’s House building, adjacent to the main building fronting on the harbour, The Library building at the rear of the property and Jacaranda which is the stand alone cottage/room nestled in the centre of it all. 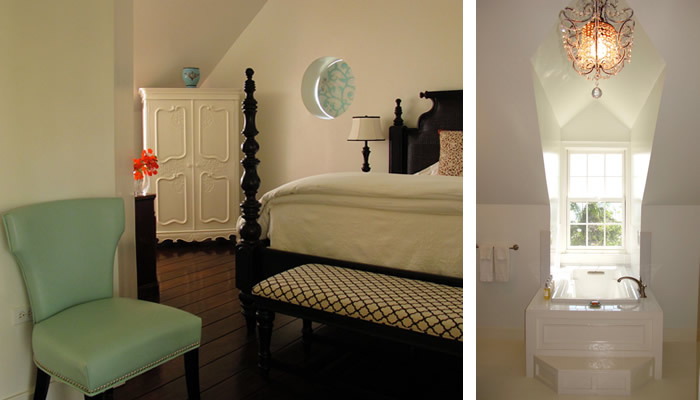 Our rooms are designed and inspired by India Hicks in a classic plantation style. Rooms have mahogany stained, four poster beds with crisp white Ralph Lauren linens, and are draped in Indian cotton. The waxed hardwood floors are overlaid with sea-grass matting and decorated with a meticulous attention to detail. Rooms have private baths and air conditioners and feature wireless internet connection*. Some also have ceiling fans and verandahs, most have harbour views. All rooms are non-smoking. Landing guests enjoy the pool as well as beach chairs and umbrellas provided at the beach for their use. Rates are based on single or double occupancy and are subject to 12.5% gratuity and 12% VAT. $50 per extra person over the age of 16 sharing room. $30 per child age 3 to 16 sharing room.